This award-winning cherry sideboard brings together two artists from Vermont�s Northeast Kingdom. Clarner Woodworks designed and handcrafted this exceptional sideboard using graceful lines, a single board cherry top, walnut accents, and subtle details that add to the magnificent panels without overpowering them. The creative work of artist Trenny Robb is featured in the mica panels, each of which contains a Thread Leaf Japanese Maple branch and is back-lit to accentuate the gorgeous details. Oil/varnish and wax finish. A custom made cherry sideboard buffet makes a welcome addition to dining room and kitchen decor. Clarner Woodworks has a distinctive design style which is rooted in the Shaker tradition, assuring a classically elegant sideboard handmade with the highest level of craftsmanship and traditional joinery. Only the finest woods are chosen, resulting in furniture pieces that are durable and solid. Wood furniture has a timeless appeal, and a custom built sideboard buffet from Clarner Woodworks will be cherished for generations. Held biennially, the Vermont Fine Furniture and Wood Products Design Competition showcases the woodworking talent of Vermont artisans from around the state. Although the completion sometimes brings together diverse talents, there have been few collaborations as advantageous as the partnership which created the 2010 First Place Winner, the Thread Leaf Sideboard - Clarner Woodworks, a fine furniture-maker from East Burke, VT, and High Beams Lighting, creators of one-of-a-kind copper and brass lighting in Sutton, VT. Rooted in the Shaker tradition, Clarner�s furniture style calls upon elements from the Arts and Crafts movement, an international design movement that flourished in the late-19th and early 20th centuries which advocated truth to materials and traditional craftsmanship using simple forms. He is a member of the Guild of Vermont Furniture Makers and has been handcrafting custom furniture for clients across the continental United States for over a decade. Artist Trenny Robb of High Beams Lighting began her career in lighting design in 1980 with Victorian reproductions and restorations. As time went by, her work developed to incorporate other period lighting and unique designs for wall sconces, ceiling lamps, desk lamps, chandeliers, bathroom fixtures, lanterns, and outdoor lighting of all sorts. Her creations are currently featured in galleries throughout Vermont and are displayed at shows all along the eastern seaboard. So what happens when two designers who have achieved success in their respective fields come together with the challenge to design a piece of furniture that is strikingly beautiful yet functional for everyday use in the home? 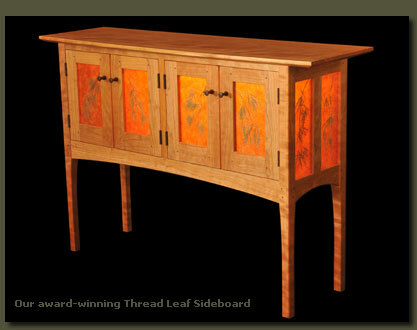 The result of their collaboration, the Thread Leaf Sideboard, was awarded First Place in the 2010 Vermont Fine Furniture and Wood Products Design Competition. Clarner Woodworks designed and handcrafted this exceptional sideboard using graceful lines, a single board cherry top, walnut accents, and subtle details that add to the magnificent panels without overpowering them. The creative work of artist Trenny Robb of High Beams Lighting is featured in the mica panels. 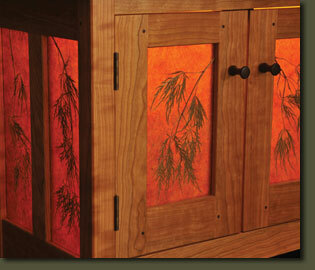 Each panel contains a Thread Leaf Japanese Maple branch and is back-lit to accentuate the gorgeous details. The dimensions of the final piece measure 34� tall by 50� wide by 15� deep. Both artists are pleased with the results of the competition as well as the fruits of their collaboration. It is likely these two craftsmen from the northeastern corner of the Green Mountain State will find other opportunities to combine their creative talents to bring unique furniture designs to the custom furniture market. 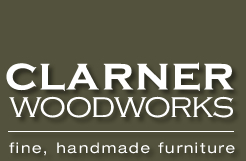 Clarner Woodworks will work with you to design the living room and dining room furniture that best meets your needs. Whether you are looking for a piece of funiture to match an existing set or wish to dream up something completely new and unique, Clarner Woodworks will guide you through the custom furniture building process and create kitchen and dining furniture that is sure to delight you. Our handmade solid wood furniture will make a welcome addition to your home.